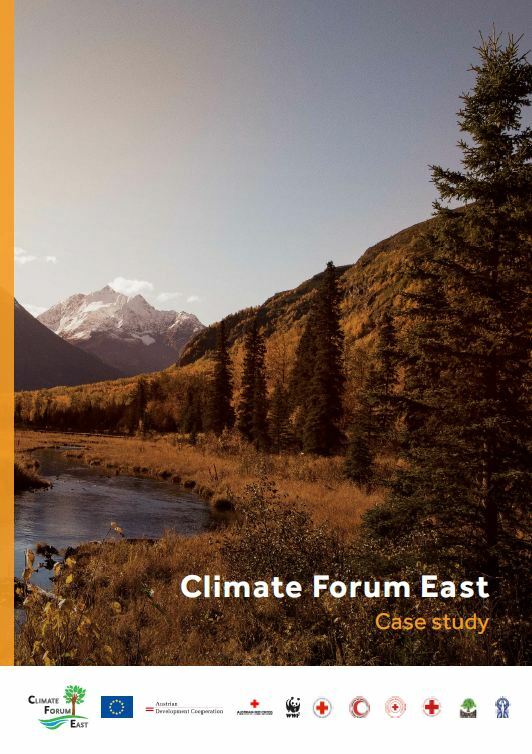 This case study summarises the successes and lessons learned from the Climate Forum East project, which ran from January 2013 to December 2014 in the six countries of the Eastern Partnership of the EU. The overall objectives of the project were to contribute to global policy-making processes on climate change, to develop civil society capacity in Eastern Partnership countries, and to contribute to advancement in Eastern Partnership political priorities in the areas of environmental governance and climate change. The specific objective was to strengthen the capacity of CSO networks to participate effectively in policy dialogue with local authorities, EU institutions and international organisations on climate change adaptation across all six Eastern Partnership countries. Conferences, workshops and training were organised in the countries of the EU Eastern Partnership (Armenia, Azerbaijan, Belarus, Georgia, Moldova and the Ukraine) on climate vulnerability assessment, advocacy and EU Policy. The following points describe lessons learnt from the implementation of the regional Climate Forum East project based on various evaluations and reflections conducted during the two project years. These key learning points have been integrated into the project continuation, Climate Forum East II. Regional aspect: The regional network is an additional stimulus for local and national CSOs and other stakeholders to get involved in Climate Forum East. The regional and international cooperation provide more opportunities for sharing experiences and knowledge. Also, climate change related issues do not know geographical borders and thus need to be addressed on a regional level. Climate Forum East reaffirmed that climate change now constitutes one of the most serious threats to nature and humans, not only in the near future but already nowadays and expressed concern at the low prioritisation of climate change adaptation efforts in Eastern Partnership Countries. In its Resolution, it recognised the need to further strengthen joint efforts for a robust response to climate change. Sub-regional cooperation: For the ease of organising certain activities and improved finance coordination, it is better to do some implementation on the sub-regional level. The sole combination of countries in Climate Forum East could seem slightly artificial, since there are no common political structures to target. Focus on youth and community actions: Young people today are among those who will be most affected by climate change, and their involvement must be central in any climate change adaptation strategy. Climate Forum East worked with young people, schools and communities, giving workshops to teachers and young people, and helping educate people about climate change and encourage youth and community action. Local level engagement: For climate change adaptation, local actions are key. In the Climate Forum East II project, more emphasis is given to strengthening local CSOs and locally driven climate change actions. These best practices should be shared with decision-makers to take findings from these local climate change adaptation projects into consideration when adopting climate relevant policies for local and national levels. Specific role of CSOs: For communication and policy dialogue, the specific role of CSOs must be clearly defined to contribute with specific expertise from the grassroots levels to local, national and regional policy efforts. This unique point of CSOs will be further developed in the Climate Forum East II by strengthening CSO capacities and highlighting CSO power to foster change on local levels. Sustainability: The general project design is broad and open and therefore provides the opportunity for enough flexibility for the different speeds of growth of the six national networks, which is likely to turn out as a valuable investment in their long-term sustainability. Each CSO network and its members should define what their expected gains from and contributions to the joint network are and build their future work on that basis. Please download the case study to view more project information. Climate Forum East was funded by the European Union, the Austrian Development Agency, the Austrian Red Cross and the WWF, and led by the Austrian Red Cross. Partners in the region were the Armenia Red Cross Society, the Azerbaijan Red Crescent Society, the Belarus Red Cross Society, the Georgia Red Cross Society, ECOSPECTRU in Moldova, and the National Ecological Centre of Ukraine. International partners were the Environment Agency Austria, the Red Cross Red Crescent Climate Centre, and the WWF International Danube Carpathian Programe. While the work of Climate Forum East has had significant achievements during the two project years, more can be done in the coming years. That is why the existing partners are continuing the EU funded project activities for another 30 months, starting on 1 January 2015, until 30 June 2017. The project will benefit local and national decision-makers, national disaster risk reduction and climate change adaptation platforms, media, local communities, youth leaders and young volunteers, as well as the general public. This project is managed by the Austrian Red Cross. Partners in this project from the Eastern Partnership region are Armenian Red Cross Society, Azerbaijan Red Crescent Society, Georgia Red Cross Society, Belarus Red Cross Society, National Ecological Centre of Ukraine and EcoContact in Moldova. International project partners include WWF International Danube-Carpathian Programme, WWF Caucasus and International Federation of Red Cross and Red Crescent Societies. To learn more about Climate Forum East II, please visit the project website.